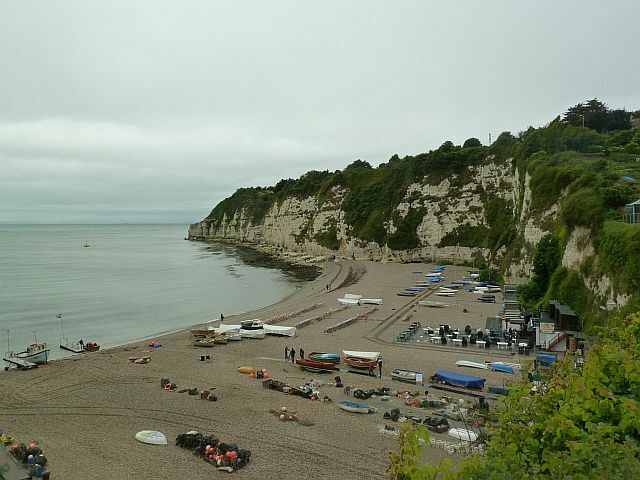 At Beer there is a sudden appearance of Cretaceous chalk rocks along a part of the coast dominated by red Triassic rocks. This is to do with the structure of the rock layers in this area. Between Branscombe to the west and Seaton to the east there is a geological structure known as a syncline. Here, the layers have been gently deformed downwards to create a kind of saucer shape. The coast slices straight through the syncline and Beer is right in the middle. To the east of Beer there is also a fault. This means that instead of the layers of chalk gradually rising upwards again out of the syncline they are cut off by a large fracture with red Triassic rocks immediately on the other side. A good place to see this is at Seaton Hole. The chalk itself formed in a tropical sea towards the end of the Cretaceous period about 70 million years ago. It is type of limestone made up almost entirely of microscopic skeletons of plankton. There is a particular layer in the chalk around Beer that in places has been quarried to use as building stone. It is very high quality white limestone that can be easily carved into complex shapes. A good place to see it in use is at Exeter Cathedral where many of the statues and carvings are made from Beer stone. Beer Quarry Caves are open to the public and have a long history stretching back to Roman times when the stone first started being extracted. Coordinates given are for infoboard at Beer. At the waypoint CLIFF1, under the cliff, the highest cliff on the beach, estimate how high it is. At the waypoint CLIFF2, under the cliff, count how many rows of flint you can see. Can you suggest a reason for the flint being laid down in layers like this? How long was chalk deposited here? Optional task: Please, take a photo of you with a GPS (or your GPS only) with Beer cliffs. Feel free to log this cache. You may not wait for permission to log. If your answers are not correct, incomplete, without picture etc., i will contact you by e-mail. But if your e-mail is not comming to me without 3 days, I will delete your log without notice.